To commemorate the anniversary of Argentina’s “Never Again” report, the Duke Human Rights Center @ the Franklin Humanities Institute is releasing its first-ever e-book. 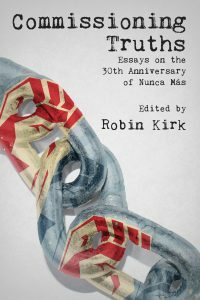 Commissioning Truths: Essays on the 30th Anniversary of Nunca Más came out of a year-long critical examination of the history and practice of truth commissions. Hosted at Duke University and cosponsored by the Human Rights Archive at the Rubenstein Library, the series sought to recognize the importance of “Never Again” while at the same time examining the current and future of truth in a human rights context. The e-book is available for free through Smashwords and on our web site. Released thirty-two years ago on September 20, 1984, “Never Again” documented abuses committed by the security forces during Argentina’s military dictatorship of 1976-1983. Researched and written by the government-sanctioned National Commission on the Disappearance of Persons, the report drew on over 50,000 pages collected by researchers who traveled across Argentina and the world to interview survivors and collect evidence. The report dramatically reasserted the power of truth, in this case fact-collection and eye-witness testimonies of the killings and torture that largely took place in secret. Prior to 1974, the only other influential example of accountability were the Allied trials of Nazi officials at Nuremberg, held by the victors. “Never Again” was the first time a government authorized an independent entity to investigate its former — and often current — employees. For Juan E. Méndez, a contributor to the e-book and Argentine lawyer and torture victim, “Never Again” created a mechanism outside the courts that was essential for transitioning democracies. “Nowadays, truth telling and truth seeking are staples of how societies reckon with legacies of very serious human rights abuses,” he notes in his essay. Other contributors to this e-book, available for free download, include Eduardo González Cueva a transitional justice expert and former staff member of the Peruvian Truth and Reconciliation Commission; Pamela Merchant, a former Executive Director of the Center for Justice & Accountability; Kimberly Theidon, Henry J. Leir Professor of International Humanitarian Studies at the Fletcher School, Tufts University; and David Tolbert, third president of the International Center for Truth and Justice. A .pdf of the book is available here.